If anyone qualifies as a multi-hyphenate in today’s independent film culture, it’s Kentucker Audley. During my 11-year stint programming Maryland Film Festival, I got to know Kentucker as the director of such DIY feature films as the Memphis-set Open Five (2010), as well as the star of Dustin Guy Defa’s Bad Fever (2011) and Amy Seimetz’s Sun Don’t Shine (2012). More recently, he delivered an unforgettable lead performance in Charles Poekel’s Christmas, Again (2014), and with Vine star Albert Birney co-directed 2017’s surreal melancholic comedy Sylvio. On top of all that, he edits hilarious viral video-essays and run his own merch line, Movies Brand. 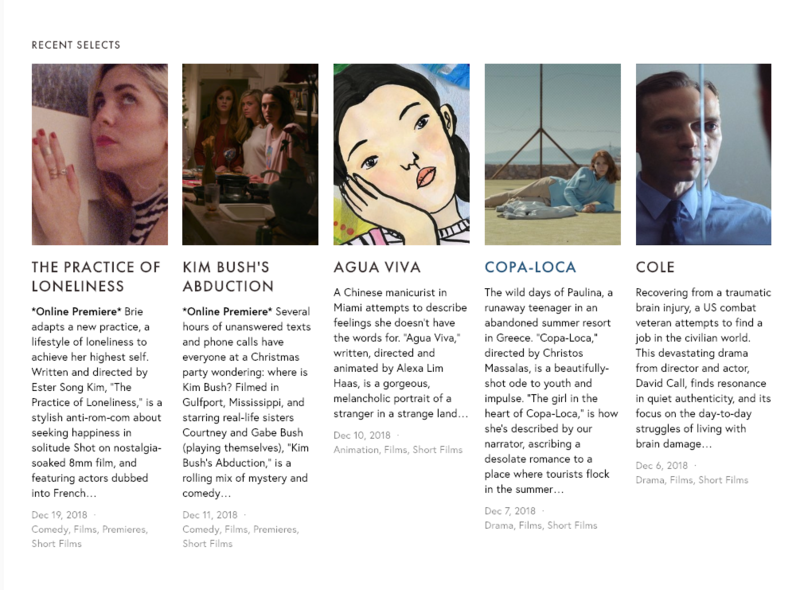 Kentucker also runs NoBudge, a content-curation site specializing in short work from new voices. Like a great film festival shorts section beamed into your home, NoBudge is one of the Internet’s top showcases for independent work. The scope of its programming spans and defies genres; it’s a place where the concept of film-as-art always feels honored. It was a pleasure zooming in on this project; even after a decade of knowing Kentucker, I learned a lot, and found his incredibly thoughtful answers even more resonant than I anticipated. What was the genesis of NoBudge? What relationship did it have to your own experience as a filmmaker? Around 2011, I started seeing all these new movies. They were good movies, but they were so small, they weren’t registering with film festival programmers or distributors. I thought they deserved to be seen and appreciated, but there wasn’t a channel that focused entirely on no-budget movies, and I thought there could be. It seemed important to present these films in a supportive way and give them context. As far as the relationship to my own work: Early on, I felt a lot of frustration with how impossible it seemed to get people to watch or care about my films. The first couple times I got a good review, it was a thrilling feeling because someone had taken the time to think and write about my film, and they understood what I was going for. I wanted to pass along that feeling. Also, before I was a filmmaker I was a film fan, and NoBudge is a natural extension of that — just loving these movies and wanting to talk about them. How many films have you hosted over the years? Over 500. We used to post once a week, but now it’s almost every day. Mostly shorts but some features. In the early days, we did more special limited screenings, like Alex Ross Perry’s first film, Impolex, and David Lowery’s first feature, St. Nick. Nowadays, it’s mostly shorts. There are so many great short films right now. I think they should be a bigger part of the conversation around indie movies. What makes NoBudge distinct from other streaming sources? We focus entirely on no-budget movies. We started with a lot of art-house experimental stuff and slow cinema, then expanded the range of our style — from absurd comedies, to heavy character studies, to strange animation. It’s important to pay attention to these movies and to treat them seriously, because there’s no filter involved — filmmakers don’t have to convince rich people to give you money to make a no-budget film. You just make it, and it doesn’t have to conform to any particular notion, and it doesn’t have to necessarily make money. Do all the films come from your call for entries; and if not, where else do you look for content? Most of the films come from open submissions. Sometimes I’ll see a film at a festival, or on another site, but the majority are from people cold-submitting, and I love discovering something that I know nothing about. What are some of the films you see as emblematic of the NoBudge style? Who are the NoBudge success stories? The films of Doron Max Hagay come to mind. He’s probably made fifteen shorts over the last three or four years, and they’re all great. He has this specific style, a blend of absurdity and sincerity that’s like magic to me. Other filmmakers like Erin Vassilopoulos and Lauren Rothery are also emblematic — they’re quietly creating these oddly beautiful visions with great atmospheres and characters. They’ve stayed under-the-radar for the most part, possibly because they aren’t screaming about how great they are, but they’re making vital work. Naima Ramos-Chapman is another one making compelling work. Her film And Nothing Happened is a powerful magical-realist take on the aftermath of a sexual assault, and she’s since done a lot of work on the new HBO show Random Acts of Flyness. Our lineup this month is especially good: Agua Viva by Alexa Lim Haas is a beautiful animated short about a lonely Chinese manicurist in Miami. Kim Bush’s Abduction is a funny little Southern mystery about two sisters trying to reach their mom on the phone. It’s incredibly important. We need responsible curators in our culture at every level, not just in film and art. But most of what we consider curation nowadays is algorithm-based, and I think that’s the wrong approach. Art and film curation in particular should not be optimized to appeal to the biggest audience, or to get the biggest reaction. Ninety percent of the time I go to Netflix, I don’t end up watching anything because they’re obviously just going by the numbers and pushing the same content to everyone. It’s not a trusted relationship, and I think it damages our culture more than people realize. Curation should involve a long-term relationship and building of trust between two parties, not just giving somebody something that’s easy to react to. What social responsibilities do gatekeepers in the arts have? Has your understanding of diversity and representation changed over the years? Since white men have historically held most of the power, it’s heavily on our shoulders to give up some of that power, or to boost the signal of underheard voices. There’s a huge responsibility there for programmers to seek out positive or complex portrayals of disenfranchised peoples. Discrimination has a lot to do with the way movies and TV have represented people of color and non-heteronormative sexuality, and that needs to be rectified. My understanding of the issues has deepened in the last couple of years, but this is a lifelong pursuit, not just some trendy issue. Everyone needs to realize the extent of the problem, the struggles of people of color, the LGBT community, and women, because these are issues that we need to come to terms with in our society for the long term. NoBudge is not a political or activist site, and our vibe is often pretty light, but it’s still important to exist in the real world. It shouldn’t just be this thoughtless entertainment or escapism. You can find more about Kentucker Audley on his official site, explore NoBudge here, shop Movies Brand here, and keep up with the latest from him (as well as Movies Brand, and, of course, NoBudge) on that cacophonous hellscape Twitter.com. Eric Allen Hatch is a film programmer, film critic, and filmmaker consultant based in Baltimore, MD. 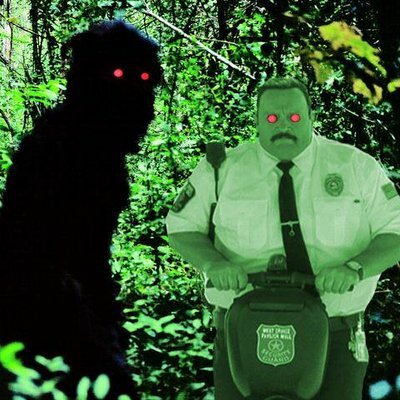 He authored the much-discussed Filmmaker article "Why I Am Hopeful”; he can also be found photoshopping Paul Blart into transgressive art-house films on Twitter/IG and at ericallenhatch.com.